Early voting is now underway for the Nov.2 General Election. Early voting will continue through Friday Oct. 29. 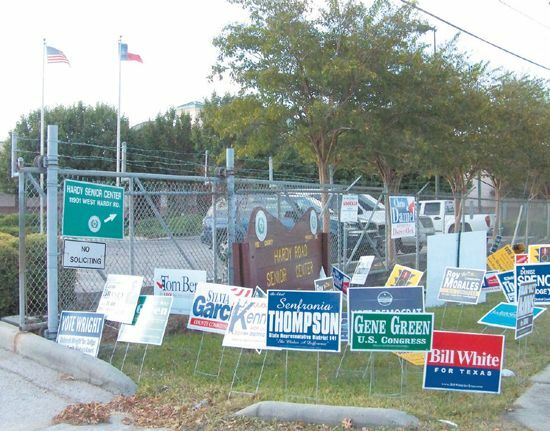 Local polling places for early voting are Northeast Multi-Service Center, 9720 Spaulding, the Octavia Fields Branch Library, 1503 South Houston Ave. in Humble, the Hardy Senior Center, 11901 West Hardy Rd and the Acres Homes Multi-Service Center, 6719 W. Montgomery Rd. Voters may cast early votes at any location, regardless of where they live in the county. On the national scene, incumbent Congressman Gene Green sees a challenge from Republican Roy Morales and Libertarian Brad Walters. Sheila Jackson Lee, also a democrat, will face off with Republican John Faulk and Libertarian Mike Taylor. Closer to home, the race gaining the most attention in Texas is that of governor. Rick Perry, who has served as governor longer than any other person, is seeing a challenge from former Houston Mayor Bill White. Kathie Glass, representing the Libertarian Party, and Deb Shafto, of the Green Party, are also running. In State House District 141 Republican Michael Bunch wants to unseat Senfronia Thompson. Armando Walle will not be contested for State House District 140. Topping county races is that of Harris County Judge. Democrat Gordon Quan is challenging incumbent Ed Emmett. Precinct 2 Commissioner Sylvia Garcia will try to hold off a challenge by Republican Jack Mormon. For those living in the Houston city limits, there are three important propositions on the ballot. Prop. 1 calls for “Creation of a Dedicated Funding Source to Enhance, Improve and Renew Drainage Systems and Streets.” The proposition calls for the creation of a “pay as you go” funding source for the repairs and upgrades. Prop. 2 asks that the residency requirement for district council members be reduced from 12 months to six months for the November 2011 election. Prop. 3 asks whether the city should continue to use red light cameras to enforce state or local traffic laws. This year’s General Election will be held on Nov. 2. Polls will be open from 7 a.m. to 7 p.m. To locate the proper polling location, voters should go to the Harris County Clerk’s Election website www.harrisvotes.com. A man allegedly set a townhome on fire on Oct. 16 after a fight with his girlfriend, Harris County Deputies said. The blaze happened near Aldine Mail and Highway 59 last Saturday morning. The incident happened at a home in the 5800 block of Twisted Pine Court, part of Pine Village North subdivision. According to detectives, about 1:30 a.m. on Saturday, Oct. 16 the man poured gasoline on the exits of the house, setting the townhome on fire. Inside the house on fire there were three kids and a woman who escaped by jumping from a balcony to a neighbor’s house. Detectives said neighbors detained and held down the suspect until deputies arrived. The only person hurt during the fire was the suspect who suffered some burns and was taken to the hospital for treatment. He was reported to is unconscious afterward. 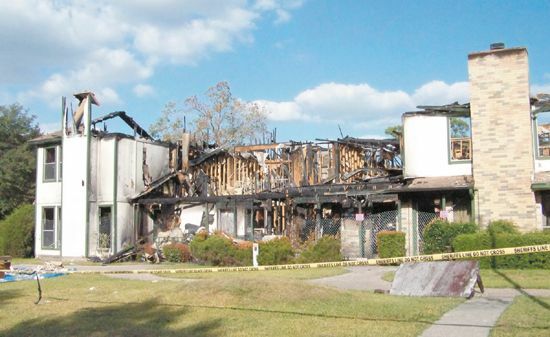 A total of six units were destroyed and the suspect, whose name is unknown, could face attempted murder charges as well as arson and assault charges. 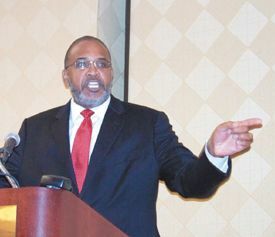 GREENSPOINT– Some 500 educators and supporters of the North Forest ISD gathered for lunch last Friday at the Marriott Hotel, and heard a report on the “State of the District 2010” delivered by a Powerpoint program, and an animated talk by NF ISD superintendent Dr. Adrain Johnson. The meeting started with welcoming remarks from the 2010-11 Teacher of the Year, Mrs. Tamica Kirby-Barnes, NF High School principal Dr. C. A. Williams, and Board of Managers president George McShan. In his remarks, he noted the “incredible progress” of the district in the last two years, with 6 Recognized campuses, and a new attitude toward management and education. Board of Managers’ Carolyn Bullard-Williams introduced the staff produced Powerpoint review of the District’s progress. This video covered the high points of the year, including the Mission, the Vision and the Staregies which are guiding the new NFISD. Strategic Priorites on the video included Student Achievement, Quality Workforce and Compensation, Technologically Advanced Facilities, Financial Stability and Governance, and Safety and Community Involvement. Superintendent Johnson’s talk elaborated on each of these themes, with personal experiences and heartfelt dedication to achieving greatness within the District. He noted that “we’ve come a long way” with reference to the last 200 years of minority struggle for equality, as well as the last two years of improvement at the District. He singles out the Board of Managers for their help in the achievements. 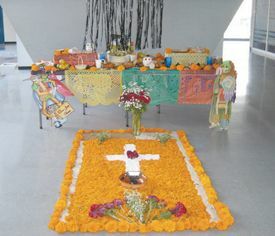 He also presented recognition to his department heads. Johnson also touched on some of the problems of the District, and assured the audience that they were being solved. One of the biggest, the Unacceptable rating at the high school, is being met with a new spirit, new leadership, community involvement, and state help, he said. He repeatedly made reference to the relationship between the school district and the community, and how they need to help each other to move forward economically and educationally. Highlights of the year that Dr. Johnson referred to in his talk included: a YES charter school within the district, to offer an educational option to academically interested students; a dual language learning environment; a partnership with Houston Community College for dual credit/college courses; use of Title I Priority Schools grant to improve the high school; receipt of a $1 million BP grant; a full day Early Childhood program; recruitment of highly qualified teachers, including the TFA program; computer access of student information from home computers; website redesign; expansion of a Business Partners Program; community festivals, clean-up, and outreach; a revamped and award winning police department. In addition, the District is working to establish an adjunct Education Foundation to facilitate funding of additonal advanced programs. The luncheon closed with remarks from Congresswoman Sheila Jackson-Lee, whose interest in the District has helped raise large sums of money for improvements to facilities and programs. She celebrated the “Bounty of Diversity” represented by North Forest. A Harris County Grand Jury has chosen not to indict a Houston city councilman on a charge of evading arrest. Houston City Councilman Jarvis Johnson, who denied fleeing police when he was arrested on June 30, received word Oct. 11 that a Harris County grand jury declined to indict him. On June 30, around 9:45 p.m. Houston Police Officer attempted to stop an alleged speeding vehicle in the 2300 block of the Eastex Freeway service road. HPD spokesman John Cannon said Officer Steven Running turned on his emergency lights and siren and followed Johnson five or six blocks before the councilman pulled into a private driveway and stopped at 2606 Staples. Johnson, in a statement, denied that he was trying to flee the office. Johnson was reportedly driving 62 in a 45 mile per hour zone. Johnson was arrested. He later posted $2,000 bail and was released. He was not issued a citation for speeding. Johnson’s attorney, Loretta Johnson Muldrow, said that the question was how soon did Johnson pulls over once he noticed the police car. In evidence presented to the Grand Jury, Muldrow showed that the time period was less than one minute. In a statement issued shortly after the arrest, Johnson questioned whether the arrest was related to formal complaints the councilman had made about the number of “speed traps” in his district. He has since urged Houston Police to stop setting up “speed traps” and concentrate their efforts in neighborhood patrols. 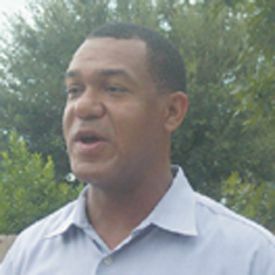 Johnson has served the northeast side of Houston, including parts of Aldine and North Forest ISD since 2006. 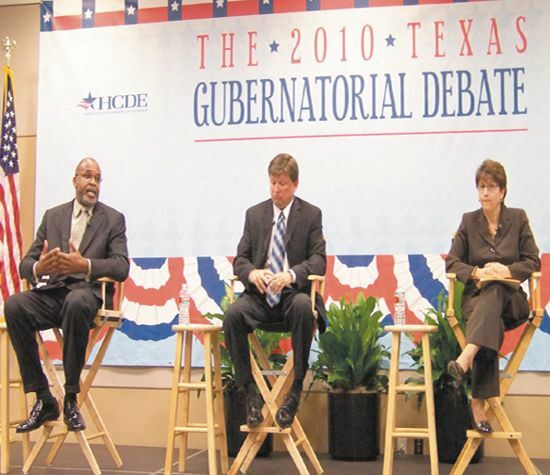 HOUSTON– As part of the Gubernatorial Debate program, detailed in another article in this issue, three superintendents of local school districts were also asked to speak on their experiences and opinions on Educational issues. Participating were Dr. Wanda Bamberg, Aldine ISD; Dr. Adrain Johnson, North Forest ISD; and H. D. Chambers, Stafford Municipal District. These same topics were also addressed to the Gubernatorial candidates in the latter part of the program. The forum and latter debate were moderated by Channel 13 news anchor Melanie Lawson. The forum was held at the Harris County Dept. of Education building on Irvington, and simulcast on the internet. It is available for watching now, at www.hcde-texas.org. Dr. Bamberg mentioned that now we often train to be good test takers, due to the emphasis on TAKS. However, she said the challenge was really to prepare students for college, not tests. Dr. Johnson gave a synopsis of his district, and some of their problems with accountability. He mentioned that their current TEA rating, unacceptable, was due to data that was old and in some cases, incomplete. He noted that his district was 70% African-American, and 30% Hispanic, not the average mix for local districts. When asked about dropouts and completion rates, Johnson noted that the economy is having an affect, as some students leave to work or solve family problems, and dropouts need a comprehensive solution in the community. Dr. Chambers said that the #1 reason students drop out is they feel no one cares. He noted that the state has helped solve the problem with flexibility in school dates and hours, and the Dropout Walk has also made a difference. Dr. Bamberg noted that “sometime our system doesn’t match student’s needs” implying that they were working on different educational programs to solve the problem. Dr. Johnson noted that other reasons for dropouts, not related to the school district, are teen pregnancy, problems at home, health problems, and economic distress. The East Aldine District’s quarterly Business & Economic Development Forum was held at lunch last Thursday, with strong attendance from interested parties. 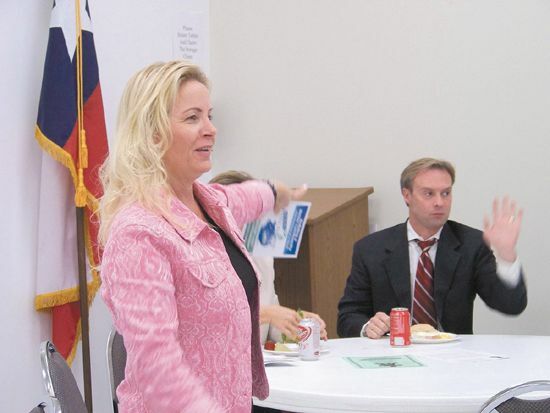 About 45 persons attended the luncheon, held at the District’s offices at 5202 Aldine Mail Route. Gretchen Larson, Economic Development Director, presented further details of the Shoppers Card program, and then took comments from the group on the business community’s interest in the program. The program is intended to function as a “Loyalty Card,” where shoppers can get a bonus offered by the merchant, for shopping in local East Aldine stores. The Shopper’s Card does not cost the customer or the merchant anything except the incentive offered by the store. However, this in turn brings repeat and additional business to the business. The incentive is decided by each individual business, and could be a discount, or a special merchandise or service award. The East Aldine District would benefit from additional sales tax revenue, but in turn would offer participating merchants free or reduced cost advertising and publicity, in newspapers, websites, and billboards. A free window sticker would identify participating stores. Some of the meeting’s participants offered suggestions for approaching merchants, and mentioned concerns that some had in joining the program. It was suggested that the District could offer each store owner a free publicity or ad as a way of immediately benefitting. Larson indicated that many of the ideas and suggestions from the meeting would be studied, and some implemented to improve the program and attract more merchants. 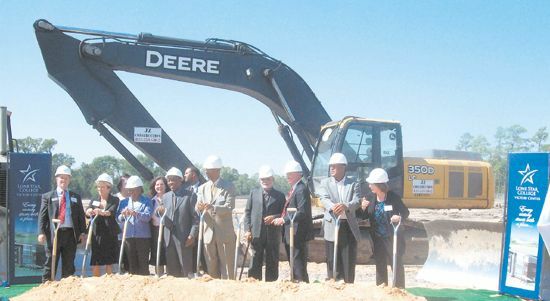 There was a groundbreaking ceremony last Friday Oct. 1 in the 4000 block of S. Victory St. for the upcoming LSC-Victory Center that will replace the LSC-Carver Center. The LSC-Victory Center is being built in the southern portion of the LSC-North Harris service area. “It’s about an opportunity and giving the people living here a chance to be successful,” said Dr. Head. At the beginning of the ceremony, Dr. Head recognized all the ISD Board Members, as well as Dr. Wanda Bamberg, Aldine ISD Superintendent for their partnership and hard work as well as Jarvis Johnson, Council Member for being present. Dr. Head conclude that classes will start in Fall 2011, and they expect to have a little bit over 1,000 students enrolled at this facility.